D-Day, Sixty-Five Years On. a post from last year. This interview was conducted in 2001 before a student audience with a veteran of the Normandy invasions. It originally appeared on my other website, www.hfcsd.org/ww2. …I hate snakes, I could feel the snake slithering between my legs. They were firing live ammo over our heads and I said “hey (whistles) you know,” but I endured and they didn’t bother me, the snakes, and I didn’t raise my head, so I’m here to tell you about what happened after that. I got assigned to USS LST 27. I said to myself what the heck is a LST. We boarded in Norfolk VA. I carried my sea bag, along with the rest of the graduates of boot camp, up this long gangway. This was the biggest vessel I had ever seen in my life. If you had it up here on Lake George, it was 327 feet long, imagine that, and 50 foot wide. That’s a big ship. Matthew Rozell – What does LST stand for? 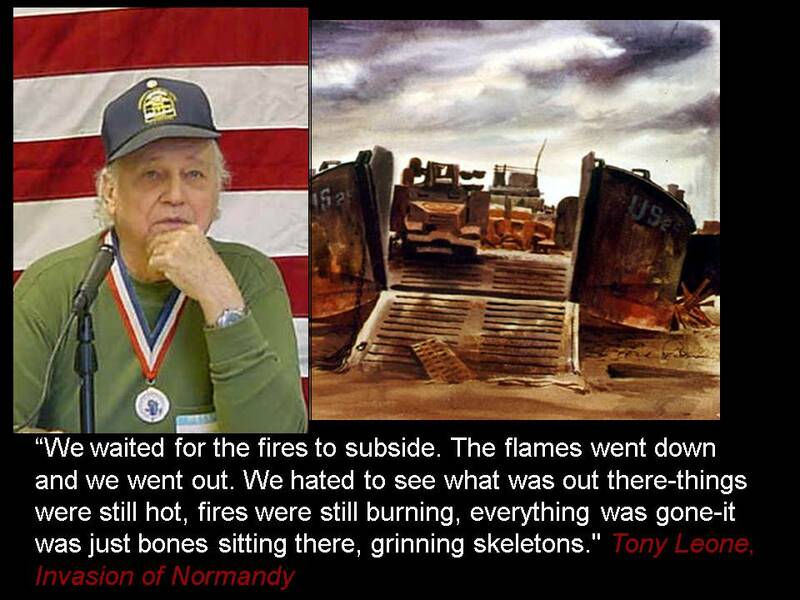 Anthony Leone – Landing Ship, Tanks. MR – Landing Ship, Tanks. So what was that supposed to be for in the Normandy landings? MR – Then you turned around and went back? MR – What is an AA gun? AL – Anti-Aircraft Gun, it was a 20mm… it’s obsolete now, but then it was a pretty good gun, it was pretty accurate, made in Sweden. I was about to get another magazine and load, when a bomb landed on the port side, near miss, and it swung our LST over to the starboard. I was going into the dark Mediterranean with a magazine in my hand and I said “There goes Leone, you’re done.” The aimer grabbed me by the back of my life-jacket and pulled me back. That was close, that was my first “baptism by fire” right there. I was 18 years old, screaming, hysterical, shaking a fist and if a real German had popped up in front of me on the deck, I would have fainted dead away. I was scared-heroes are heroes, but most are scared. MR – So that was the airplane attack. AL – Yes, that was the Luftwaffe, JU-88’s and Dornier torpedo bombers. We succeeded in almost completely obliterating the British anti-aircraft cruiser on our port side. I think some of the guys did it deliberately, some guys didn’t like the British too much. They knocked the radar off, that’s a story I don’t wish to go into. We sailed from Africa and reached Africa, with out further incident. We sailed for England. We landed in Swancea, Wales. We got liberty. And we un-loaded an LCT. An LCT is a long wide flat box sort of landing craft where the ramp drops down and the conning tower is in the back and we had one top side. We carried it piggyback. What we did was fill the starboard bilge tanks with water and then chop the cables holding the LCT on, on these greased wooden skits. Severing the cables and the thing would slam into the water with a big splash. We got rid of that thing, there were some heavy seas and we were top heavy. We had no keels to speak of. MR – Now is that what would land the men, later on? AL – Yes, the same ones, matter of fact, that went in there…….. from there we went to Southampton and then Falmouth. From there we became part of the ‘B’ back up force for the D-Day landings, at the end of May. We took on units from the 175th Infantry, which belonged to the 29th Division. Everything was frozen, we couldn’t move…..
MR – Now this is about what date? 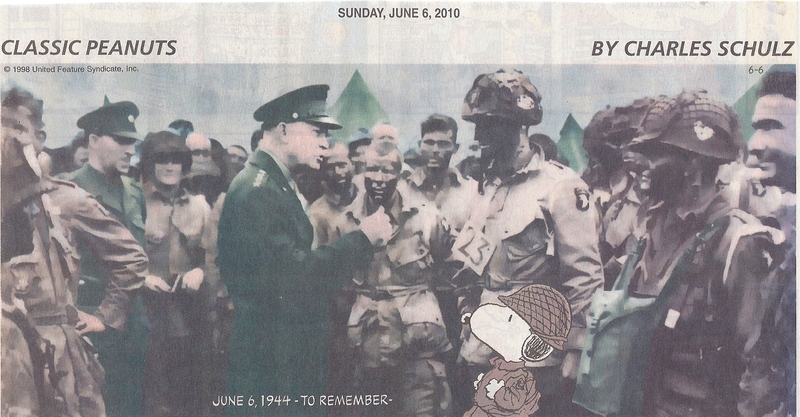 AL – This was about the end of May, about a week before D-Day. MR – So you’re getting ready for the Great invasion. AL – Yes, we were sealed off, the area was sealed off, we couldn’t go on liberty, we couldn’t visit the British girls, which was quite a sacrifice in those days, they were all over the Yanks. We were like the invention of sliced bread, they couldn’t get enough of the Yanks. The Yanks had a lot of money I guess, and they showed the British service men up pretty bad. Their behavior was abominable…. AL – The American troops over there. The British treated them real good, the Americans were spoiled had a lot of money, and….it’s the same old story. They sealed us off, and on the 4th and 5th we were ready to go. We headed toward Piccadilly Circus, that was the name of the circle in the middle of the channel that we were supposed rendezvous at, from there the flotillas would go towards the English beachhead and we would go towards the American beachhead, Omaha and Utah beach. AL – Yes-it was real stormy. They called it off and Eisenhower was really blown away by it. They waited, and I guess a British meteorologist saw a break, a window in the weather. Eisenhower had decided to go for it, he had his fingers crossed, he had a letter ready apologizing for the loss of lives and withdraw from the continent in case it failed. So, we went, the first units moved up from British ports of Southampton, London, Plymouth and Portland. We were the second, the backup force from Falmouth. By the time we got to the beachhead the next day, it was a mess. This was on June 7th. All you saw was a layer of white smoke on the beach. The Americans had gotten off the beach by late June 6th. The [US Army] Rangers had gotten in behind the Germans, but we were there, it was still hot, there were still mines all over the place, hedgehogs and stakes driven in the ground with mines sitting on them. At high tide when you came in you couldn’t see them. Our LCVPs had to negotiate between them, this was impossible at high tide, you had to wait until the tide was way out, then the soldiers had to walk almost half a mile over bare land, no foliage or anything. Of course the Germans mowed them down like a wheat field. ,As I said before there were German privates just sitting there with machine guns, just killing Americans and crying as they were doing it “Please go back I don’t want to kill no more” (Repeats this line in German). At one point General Bradley was going to pull them off, take all the people at Omaha Beach and bring them over to Utah. Utah was a pretty successful landing-there, casualties were almost negligible. We came in with the LSTs. We had already launched our LCVPs and brought in supplies and troops. MR – What’s a ‘LCVP’? AL – Landing Craft Vehicle Personnel, that is, a Higgins Boat. It was invented by Higgins, a boat builder from the United States. Then it was time for us to come in and unload the tanks. As we came in, it was pretty hard to negotiate because the mined obstacles were still all over the place and there were pieces of human bodies floating all over. The American soldiers had the life belts on that you activate and they blow up, they had a CO2 cartridge. What it did was, they had a heavy pack on, and it would up end them and drown them, they couldn’t get loose. We saw a lot of soldiers floating that way. Their life belts worked alright, but it killed them. Their bodies floated to and fro all day long. We came in and we were moving in. Now up in our conning tower our officers had barricaded themselves behind a pile of mattresses up in the bridge, not that they were “chicken”, they were just being smart about the whole thing, they didn’t want to get hit with shrapnel. We proceeded in. On Utah Beach on June 19, a big storm stirred up a lot of mines. Now our lookout yelled “Wreckage in the water, dead ahead!” We stopped. Apparently there was an LCT had been hit earlier and it was laying there. Had we gone another 25-30 feet we would have been impaled, practically stuck on the thing-we couldn’t move. We kind of backed up and motioned for the LST in line behind us to go around. When they did, they went around us, and as they made that move they blew right in half; a mine. A huge structure like an LST, 327 feet long, welded steel, 50 foot wide, blowing in two. Now the crew aboard it had a motley assortment of pets. They had pigeons, and chickens. What the hell would you have a chicken onboard for?… Chickens and dogs and cats. This was strictly forbidden, but they let them get away with it. We were the “Suicide Navy “, they called us. A very apropos title. We proceeded to go in after we saw that. We were not too enthusiastic about going in and hitting the beach we said, “If this is happening here, what is going to happen there?..” Even though it was a day later, June 8th, we started to move in on to Omaha Beach. We were all armed to the teeth. We had our clothing well impregnated with chemicals to withstand a gas attack, and when your body got out of it, that stuff would drive you crazy. We had that on and we were all ready to go over, life jackets and helmets, I was manning a 20mm and we went, all of a sudden the PA crackled. I heard the damnedest noise, that scared me more than the enemy, really, when it first came on, (singing) “Mares eat oats and does eat oats, and little lambs eat ivy, a kid’ll eat ivy too, wouldn’t you” (stops singing). It was the voice of our skipper, he was dead drunk. (audience laughs) He was a very solemn looking individual, dark, we couldn’t see him and we called him “The Shadow” at night. When he walked on the bridge all you would see was the glow of his cigarette. He let it burn to his lips and then spit it out, he was fearless. Here is this guy who is fearless and he is singing “Mares eat oats”, I would have chosen a different tune really, but everyone burst out laughing , it was a morale builder in a sense. It told us the captain was human after all and he was just as much afraid as we were. We went out to see what we could do. I reached down and got a piece of shrapnel through the top of my helmet, cut it open and broke some skin. I didn’t realize it until the thing fell of my head landed on the deck. I went down to see what I could do to help. You couldn’t get near the thing the fire and the flames were so hot. A couple of individuals did go out and they rescued somebody, and I went out to get another helmet. I need the another helmet in the worst way. They were all over the place like coconuts. I see one of them, and I went out to get it and zing zing zing!!!!!! The sand, burst of sand right in front of it, some Germans probably anticipated my move and said “well this guy’s not going to get his helmet”. One of our officers, a deck officer, a little fellow named Surf, went out and dragged somebody back to the ship. They always made fun of him because of his size, he was puny, he was like another Don Knotts, they all used to pick on him, make him stand on a table because he was Jewish, things like that, that was World War II. A colored steward would have to stand on the back of the bus, even though he survived a lot of battles, he had to stand on the back of the bus in Norfolk. This is what World War II was like. He went out in the surf -he was crazy and so forth, he got back and I think he got the Silver Star for it. He was ten foot tall in our eyes after that. There was one medic, he’s a friend of mine now, he was a medic at the time and he belonged to the Foxy 29 medical team. They were a medical team assigned to all the landing ships, like the LSTs, and they were composed of one or two naval doctors and a team of corpsmen. We had a surgical operating station in the back of the tank section, it was a complete operating room and we operated on the wounded there. At times we’d go back to eat and we’d set our trays down in the dinning room. They’d operate on the tables there, and our trays would slide in the blood and stick to them. Talk about appetizing, well you don’t feel much like eating after that. To get back to the burning trucks, finally someone closed the damn bow door. So, we lifted the ramp, it takes ages for that thing to come up on chains, we closed the bow. We waited for the fires to subside and the flames went down, and we went out. We hated to see what was still out there. Things were still hot, fires were still burning, everything was gone -it was just bones sitting there grinning skeletons. We started out low, the fellows of the 175th took off with the trucks and the anti-tank guns. They didn’t cast one eye towards the human barbecue, I call it, that’s what it was. They looked the other way, unbeknownst to them they were heading into a bad battle with the Germans at St. Lo. The [German] 352nd Infantry Division wasn’t supposed to be there, but it was and it hit them. On June 7th, we started carrying wounded back, became sort of a hospital ship, because we made many many trips back and forth across the channel. Our tank deck had stretchers, metal things that clipped in and you hung bars and stretchers on. We had a lot of wounded. Among the wounded, we had enemy and our own troops together. We didn’t differentiate when it came to surgery, they were treated the same believe it or not, this is the way the American mentality worked. The Germans probably weren’t that way at the time, but we treated everybody the same. One German boy, couldn’t have been more than 13 or 14, had his arm blown off up to here (points to above the elbow). I was out feeding the prisoners and I came to him and I had a can of creamed chicken, where you heat up the can, I proceeded to take a spoon full and put it in his mouth. He took it in his mouth and spit it all over me. He was a Nazi, Hitler Youth, only 12 or 13, I think. About that time I was about to take the .45 out and kill him, I felt like doing it, really. The fellow next to him, a German prisoner, was my age and my God he looked twice as old and his hair was gray. He had apparently been through an awful lot. He was a member of the 352nd Infantry Division out there. They had been through bombing from the air, they couldn’t come out in daylight -our planes would hit them with rockets, knock out their tanks, and their tanks would have to move by night, couldn’t move during the day. The German Tiger tanks were notorious for bearings failure, they were awful heavy, even though one lone Tiger tank could knock out ten of our Shermans. Our Shermans were junk really. The older fellow, 18 years old, same age as me, looked old enough to be my father at the time. He said “You must forgive him, he lost his parents in Berlin, the American air attacks killed his parents, and his entire regiment was wiped out, he is alone. Your mortar got him” [makes a crazy lunatic gesture and whistles] that’s the universal sign. Sometimes I worry about him, wonder what happened, he was an enemy. At the time we hated the Germans, we had the Nazis aboard that slaughtered our GI’s at Malmedy, during at the Battle of the Bulge. They were under double guard because the crew was all trying to get at them, and kill them . In fact one of the crew had relatives in the army who were prisoners of the Germans. Real bad feelings. MR – They don’t know that story, these kids. How many Americans were killed? They surrendered and the Nazi SS killed them. You transported these people back ? AL – We transported them back to England for trial, boy you want to see them, they were different, they were not typical German prisoners. They were arrogant. They were selected for height, blue eyes, blonde hair, and they looked down on us. Yes, the SS, they were bad news. They had the death head symbol, the symbol of a skeleton on their caps. All night long we had double watch on them. There were guards, MPs, and guards with machine guns. The crew was trying to get to them, all night long. I couldn’t sleep, I’ll tell you right now. I mean a stray bullet, who wants to sleep with something like that going on. We carried a lot of wounded back and forth. One of the first casualties we had aboard, was off of the Coast Guard’s LST 16, he was the coxswain of a LCVP, bringing in the soldiers. They hit a mine, blew both his legs off. They brought him on our LST and put him on the operating table, he died probably an hour later, he didn’t have a chance. They brought in a Navy officer, his LCVP got blown sky high. He didn’t have a scratch on him. That’s what we got all day long. We got British paratroopers, English flyers, American flyers, casualties. Before we hit the beach they were coming on board. They were bringing them out to us on Rhinos. Rhinos were like a pontoon with an outboard motor on it. They put them on that and they brought them out on LCVPs too. A lot of the time we couldn’t sleep at all. All we could hear were the groans of the wounded, the screams of the dying and pain, and the gurgling of the dead. You noticed that most of all. They have that vacant look in their eyes like they left this world and gone. I guess the only thing about that is you don’t have the pain anymore. I was 18 years old, I shouldn’t be there. It was hell of a waste… quality time, no way. But I wouldn’t have it any other way because as I pointed out before, Mr. Rozell has a copy of Stud Turkel’s book The Good War and it was a “good” war. We had our fleet sunk at Pearl Harbor. What would you do if somebody was coming in your house, grabbing your family? You have to fight. It was a good war, we were fighting for a cause. I fought against my own relatives in Italy. We had Italian prisoners on board that worked in our galley. They helped the cook, they saw the ovens on board and went crazy. They were the enemy and they ran loose. The Italians were running around, the Germans didn’t like that. Italians were big lovers not fighters- I know from experience. Well before we went in and hit the beach, I talked to a second Louie from my home town. He said, “If something ever happens to me, go see my parents.” I said, “You’re going to be all right, don’t worry about it.” I got that call and went back and he said, “He’s back on the fantail.” So, I went back on the fantail, it’s the stern. It was just starting to get dark and Joe Morganson said, “There’s your dead friend from Utica right there.” He propped the dead lieutenant up I had talked to and reassured days before. This was the mentality of the time, the sickness. These guys were sick to do something like that. They propped him up, pulled the blanket back. His face was bloodied where the sniper hit him in the head. It’s the same second lieutenant, his mother and father owned a clothing store in Utica, Kessler, his name was. About that time I went nuts. I went after those guys, they were running and laughing, it was a joke to them. This was the kind of mentality contend with. When you live with people like that it’s not a good time, and you sleep with people like that, and they come back drunk, bragging about their victory with the girls. I think their brains were where the sun don’t shine. A lot of violence, one guy went crazy. We were anchored up in Rouen after D-Day, to bring troops up there. A guy had been drinking an apple cider made locally in Normandy, it was very potent drink. It’d really knock you out if you weren’t used to it. He had his gut full of it. I laid there and watched him. I didn’t trust that son of a gun. All of a sudden his eyes turned red, he was crazy. He came at me with his knife. He was slashing at me, jumping on me. Why me? I don’t know. He get this left foot right open, right through the shoe. I’ve got a big scar there. It took about 20 of us to get him down. You know he got out of the punishment? He tried to kill me, but they probably needed men desperately. I would have shot him, you know, really, because he tried to kill me, pure and simple. That is what you had to live with everyday. The wounded, the dying, the death, it became a way of life. That’s bad, that’s bad. When I got discharged from the service I got a 100 percent disability, I was a basket case. I had to get some shock treatment, once or twice. It wiped out my memory. I have written several books based on my diaries. If I didn’t have my diaries I would never recall the things that had happened. I have in my possession the declassified deck logs of the ship. Minute by minute the things that happened. Some of these officers didn’t have the time to mark everything down, believe me. The other fellows sent me their diaries. Of course they got a complementary copy of my latest book, because they gave me a part of their lives. I spent ten years in the VA hospital in out-patient treatment, I’m still going there in Albany. I would do it all over again, because it was a cause. A cause celebre, you might say. It’s nothing like what’s going on today. Tony died in July 2010. On 1 April, 1944, our slow-moving convoy designated UGS-36-bound for Africa-was attacked off Cape Cher-chel, Algeria by thirty German JU-88 and DO-214 bombers operating from Southern France. I was a loader on one of the Orlikon cannons engaged in a deadly duel with the black ghosts gliding over our heads. The DO-214s skimmed low over the waters of the Mediterranean, releasing their torpedoes while overhead, the JU-88s dropped stick after stick ofwhistling bombs. One of them fell in the water close to our port side, tipping our landing ship sharply to starboard. Heavy magazine in hand, I lost my balance and began to slide on the wet steel deck toward a certain watery death. Suddenly, I was jerked backwards as the gun pointer, reached out and yanked hard on the Kapok life preserver bindings, saving my life. I thanked him as he drew a bead on a low-flying JU-88, unleashing a stream of tracers into the dark sky above. After the war, we went our separate ways and-despite numerous efforts to locate him- he seemed to have disappeared into thin air. Recently, I received a phone call from his daughter who informed me that her father had been ill for quite awhile. He gave up trying to locate me. Well, her call was a Christmas present, I’ll tell you. She informed me that her husband had seen a web site presentation by the Hudson Falls High School titled “D-Day” featuring yours truly. My name was mentioned and the rest is history .Her dad will receive my monthly newsletter and also a special reserved copy of Vagabonds of War originally dedicated to him. After all these years, closure. Makes one believe in miracles, doesn’t it? Thanks to Matt Rozell, the Hudson Falls history teacher, I was reunited with the guy who saved my life when I was a kid in uniform. Thanksgiving time.